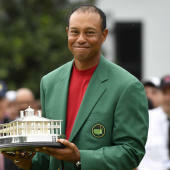 CBS Sports was with you every step of the way at Augusta National, recapping the action that ultimately led to Woods' historic victory and breaking down everything the win means. If you are unable to view the live updates below, please click here. What exactly was that mysterious logo on Tiger's shirt?